When it comes to the actions of President Donald Trump, it doesn’t matter what the subject is. It could be pulling out of the Paris Climate Accord; withdrawing from TPP; repealing Obamacare; ending restroom protections for transgender students; rolling back “Let Girls Learn” and “Let’s Move” education and nutrition regulations and guidelines; talk of reversing open policies with Cuba and cancelling the Iran deal; or returning two U.S. compounds back to Russia. 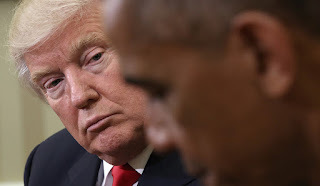 What does matter is that Trump has one singular mission: to continue his seven-year-old racist campaign to delegitimize Barack Obama and erase his legacy as perhaps America’s greatest, and blackest, president. In contrast, Trump is the first United States president without a heart, soul and brain. He is morally, ethically and intellectually bankrupt. He has the intellectual curiosity of a gnat (my apologies to the gnat community). He has no basic fundamental core from which he bases his thoughts, decisions and vision for America and the world. Instead, he is motivated and driven purely by greed, insecurity, emotion, ego, anger, victimhood, hate and fear. He lacks discipline, impulse-control and has the mood swings of a hormonal teenager. Trump’s an unhappy, unstable, never-satisfied, self-loathing lonely old man—in a job he truly never wanted and is woefully ill-equipped to perform—with a general disdain for the weak, the sick, the helpless, the needy, the poor and the powerless. Trump has serious issues with women, immigrants and brown people. He lacks respect for the independent branches of government, checks and balances, due process, equal protection, the judiciary and our free and open press. The Constitution is his enemy. So everything he does, every...single..thing, is to personally benefit him and his family. And to satisfy the three critical elements of The Trump Doctrine: (1) undo the black dude’s legacy; (2) project a screw-everybody-else-I’m-the-boss image (hence, the myriad executive orders to compensate for zero legislative accomplishments); (3) feed the base. He is the “I alone” president governing as if he’s still in full campaign mode. The president of some of the people. Trump remains terribly threatened by the likeability, popularity and accomplishments of his predecessor...a man who has a biglyzillion times more brilliance, honesty, integrity, humility, grace and diplomacy in one strand of hair than Trump has in his entire being. A devout Christian, family man and solid human being with a skeleton-free closet. A compassionate, empathetic, measured individual who deeply loves and respects his wife. He’s everything Trump is not. And it’s killing Trump. But mostly, the man with the decades-old history of racist behavior and discrimination loathes the fact that a black man is such a finer man than he. But here’s a little message for Trump: nothing you do or say...no amount of executive orders you sign...can erase the memory and legacy of one of America’s most beloved and successful presidents. But keep trying. It just makes you appear smaller and smaller every minute of every day. A perfect post-script to this article: Trump will continue to reverse everything good done by Obama but will first say that he is considering it. What he is actually doing is looking for justification, a public announcement, of why he made this decision. He has already decided; he just waits to formulate some excuse for doing it that his "yes men" and the public will buy into.